Most of us have heard about the gender pay gap, but have you ever heard about the gender leadership gap? One surprising statistic shows that only 4.6% of CEOs at Fortune 500 companies are female. Organizational consultant and keynote speaker Dr. Shawn Andrews has studied leadership styles and emotional intelligence from a gendered perspective, and argues that perception plays the key role in perpetuating the gender leadership gap. 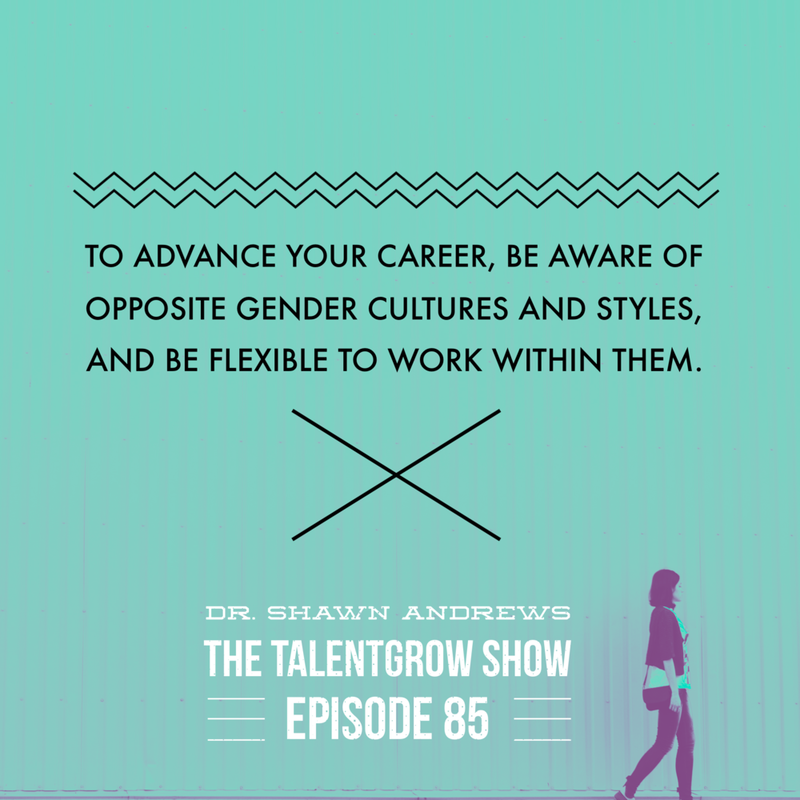 In this episode of The TalentGrow Show, I talked with Dr. Andrews about what we can do to make a positive impact on gender perception and representation in the workplace, and how we can individually leverage our biological and socialized gender differences to maximize our potential for leadership effectiveness. Listen and don’t forget to share with others! Dr. Shawn Andrews is a keynote speaker, organizational consultant, and the founder and CEO of Andrews Research International. She serves as adjunct professor at Pepperdine University’s Graziadio School of Business and Management, where she teaches courses on Organizational Behavior, Women in Leadership, Diversity in Organizations, and Leadership and Ethics. She was the 2017 Diversity & Inclusion columnist for Training Industry Magazine, and is the author of book, The Power of Perception: Leadership, Emotional Intelligence, and the Gender Divide (2018 Morgan James Publishing). Check out Shawn’s website, and be sure to download her free 25-page “Power of Perception” workbook! TEASER CLIP: Shawn: Definitely hardwired differently, no question. But, the socialization is equally as powerful, if not more powerful, actually, in how we show up at work as individuals. And, what I mean by that is, because of how we’re socialized, we have differences. So men and women approach virtually every aspect of business differently. For example, we have different preferences in organizational structures that we work within. We network different, we conduct meetings differently, we interpret information differently. We communicate, work in teams, solve problems and take risks differently. And we talked about leadership already, so we actually, virtually every aspect of business is different. I find this piece really interesting, because most people are unaware of these subtle, tender differences that show up in the workplace everyday. Halelly: Hey there TalentGrowers. I’m looking forward to sharing this week’s episode with you, all about gender differences and leadership. This week my guest, Dr. Shawn Andrews, shares with you what are the gender differences in leadership related to? We talk about whether it’s based on nature or nurture, and if statistics, according to Dr. Shawn, show that women and men lead equally effectively, how come there aren’t more women leaders in the workplace? And what’s the role of perception in all of this? We talk about the gender differences in emotional intelligence. We talk about gender differences in how men and women make decisions, and you will hear yours truly playing the devil’s advocate a little bit more than usual, because I personally do struggle with using identity politics and slicing people up according to general categories like gender, race, age, and so we talk about that and what Shawn’s research points to. Of course, what specifically can you do with this information that can help you be a better leader and more effective at work across gender lines? This episode is absolutely appropriate for you whether you are a man or a woman. Here we go. And we’re back with Dr. Shawn Andrews. She’s a keynote speaker, organizational consultant and the founder and CEO of Andrews Research International. She serves as adjunct professor at Pepperdine University’s Graziadio School of Business and Management, where she teaches courses on organizational behavior, women in leadership, diversity in organizations and leadership and ethics. She was the 2017 diversity and inclusion columnist for Training Industry magazine, and is the author of the new book The Power of Perception: Leadership, Emotional Intelligence and the Gender Divide, which we are going to discuss today. Shawn, welcome to the show. Shawn: Thanks Halelly, it’s a pleasure to be here. Halelly: I’m so glad that you’re here, and thank you for taking the time to share your insights with the TalentGrowers community. Before we get started, we always ask our guests to describe their professional journey very briefly. Where did you start and how did you get to where you are today? Shawn: Okay, actually I can make it very brief. Basically I had a 22-year corporate career in the pharmaceutical industry, where I had a variety of roles, mostly sales and training or learning and development roles in corporate. Just in 2015, I branched off from pharma and decided to put my energy into my own speaking and consulting business, and I am now in my fourth year of doing that. So, I actually have had to transition from the corporate mindset to being more of an entrepreneur mindset, just recently. But what led me to the book and actually the topics that I research and I speak on and I teach on is actually from my dissertation. I got my doctoral degree at Pepperdine, and I finished that in 2013, but my dissertation topic was actually on leadership, emotional intelligence and gender, and that’s because when I first heard the statistics about the leadership gender gap, about 10 years ago, I was shocked, like many people are. But I was also intrigued about what was behind it. So I knew I wanted to study that in my dissertation research, but that I’ve always been fascinated by emotional intelligence too and how that plays into our success in life and in work, and so basically I put it all together and studied it. That's where it started, and now like you said, I just finished a book that recently launched, and my business is now focused around those topics as well. Halelly: Congratulations on that. That’s a very big undertaking writing a book, so kudos. I just want to ask quickly, you made it very short to say that you had that illustrious career in the pharmaceutical industry – could you share what kinds of roles did you play in that career? What did you do there? Shawn: I worked everywhere from startup companies to be pharma to in between. Biotech and pharma. So, I worked the whole gamut of the industry. My roles have been primarily, half of those, half of my 20-plus years were in sales roles, and the other half was actually in training and development roles. So I’ve been a corporate trainer for sales teams, for medical affairs teams, and also for research and development, R&D teams. I’ve trained across all three disciplines, and that actually has helped me tremendously now because as you mentioned, I’m a professor at Pepperdine, and so I teach in the MBA program. All those years of training and corporate has really translated well into my teaching, but also into my consulting and speaking in my own business now. It actually, I’m so thankful for all those years in corporate, where I had that sales experience, but also especially the training and development experience. Halelly: That makes sense, that helps me kind of get the bridge of how did you end up from there to here. By the way, Shawn and I met at a conference where all of the people in the talent development industry meet to do professional development and network of course, and so this is where we happened to meet a couple of years ago and kept in touch. Now that Shawn has this new book we thought it would be great for her to share some of those insights with you TalentGrowers. So in your book, The Power of Perception, you say that you want to educate women, men and businesses on the strengths that women bring to the organization, and also the barriers that keep them from fully contributing, and also how you can build knowledge about how perception impacts promotion. There’s so much in there, of course we’ll link to your book in the show notes so people can check it out and read your tons of research in it, and lots and lots of insights we won’t be able to cover today. One of the things I know you describe a lot in your book, and when you speak about this, you think there’s a lot of differences in how successful women are as leaders or how prevalent women are as leaders, and this is kind of a controversial issue I guess out there, in the sense that some people think that it’s just ordained by biology or by biological differences or something like this. Some people out there think that it’s maybe more societal, and I know that we won’t go into all of the information that there is to consume about that, but tell us more about in terms of the message in your book, you say that perception has a big role in some of the differences we see. Could you help us understand, what do you think is maybe the problem behind women not being as represented in the leadership role right now? Shawn: That is a million dollar question Halelly. There are many reasons, and there’s not one silver bullet. There’s not one main reason. It’s multi-factorial. There are many reasons why we don’t see more women leaders. I’ll go into that, but what I mean about the perception part, and this is fascinating, is when you look at the effectiveness of leaders, going back to leadership, overall, we’re equally effective leaders. But, women are not making it to those leadership roles, and why not? Because there’s many barriers, but it all boils down to the perceptions of women as leaders, as workers, as mothers and even as wives. So, the bottom line is, when you boil it all down, men and women have different perceptions of the issues at work. They have different perceptions of each other, and we also have different perceptions of ourselves. So, when you boil it all down, it really comes down to perception. In regards to leadership, the reason we don’t see more women leading, it has nothing to do with women’s skills or competencies or lack of skills or competencies. It has to do with the perception of women. So perception is powerful. That’s why I actually, when I did the research, I analyzed the data and interviewed people for the book, and I realized that these are different concepts. They stand alone – leadership, emotional intelligence, gender – these have all been studied separately. But when you put it all together, there’s tremendous overlap. The common theme that I saw coming out of all this data is perception! It’s about perception. Yes, we have different styles in how we go about work. We have different styles in how we lead, but because of the perceptions of women – and the barriers, which we could talk about – we’re not seeing the numbers represented at the leadership levels. Halelly: I really want to understand more about what you mean by perception. You say it’s all perception, but that’s not that concrete for me. So can you give us some specific examples? Shawn: So for example, let’s tie it back into emotional intelligence. When you look at people who have done EQ assessments worldwide, men and women are equally emotionally intelligent as well, just as in leadership. Overall we’re equally emotionally intelligent. But there are gender differences. For example, women score higher than men in areas of empathy, social responsibility and interpersonal relationships. Those are three EQ areas where women score higher than men. Men tend to score higher than women in areas of assertiveness, stress tolerance and self-regard. And another word for self-regard is confidence. So, there are some gender-specific EQ attributes that fall along gender lines. Now, caveat, not all men and women fall into gender specific patterns. I’ve met many women, including myself actually, that score higher in some of the male-specific competencies, and I’ve had men come up to me after my presentations and say, “You know Shawn, I’m actually higher in the female-specific attributes.” That’s perfectly fine and it’s perfectly normal as well, but when you look at the overall trend, and millions of people who have taken EQ assessments, we do see differences along gender lines. Halelly: By the way, listeners, EQ is short for emotional intelligence. Shawn: Yes, thank you for that. Halelly: You and I, we’re so used to it, make sure everybody knows. Okay, so I hear you clear. So, you’re saying when you look at averages, when you look at trends overall, that there are differences in what women bring as strengths, when you look at the average of women. Obviously there are people that are not part of the average, that are more on the sides of the bell curve to one or the other, in any kind of statistic like this. So it’s about averages rather than every specific individual that will fall into that category. That makes sense. Everybody listening, we can’t get into all of it here, but there are many different types of competencies or characteristics that are associated with emotional intelligence, as Shawn just mentioned, so things like being confident and being assertive are also part of being emotionally intelligent, just as empathy and building relationships. But, you need both. You need all. And some things maybe come more naturally, it sounds like, to men than to women? Shawn: Yes, exactly. Let’s tie this back into perception, and back into your question. So how does this play out? The women that I interviewed and studied that were actually higher in the male specific attributes – so confidence, assertiveness, stress tolerance – those women, who displayed that at work regularly, shared with me that people have a hard time accepting them as leaders because they expected an empathetic woman. But when she wasn’t empathetic, she was met with some resistance. I also had others who were strong in more of the male EQ share with me, they were told to tone down their assertiveness, be a team player or be more social. So, they were met with some resistance too. These are perceptions, and these are biases, but these are real world examples that women have shared with me. Let’s look at the other side of the coin. Women who are actually naturally higher in the female-specific attributes, so the empathy, the interpersonal relationships, they shared with me that they are perceived as lacking substance and intelligence, and that somehow, being analytical and empathetic were viewed as mutually exclusive. Well, well all know that a leader can absolutely be empathetic, and analytical at the same time. Those are not mutually exclusive traits. But the perception is that they are. So, the perceptions of women in particular, even EQ characteristics, is it’s powerful, because it makes it difficult for women … if a woman does get to a leadership role, it makes it difficult for her to be successful because she has opposing expectations. Whether she’s naturally stronger in the male or female characteristics, she is opposing, she’s met with some resistance either way. This is a reality, and it’s based on bias. So the bias is a poison to our perception of women as leaders. What this creates, and what’s really fascinating, because you mentioned and I picked up on it, you mentioned hardwiring versus social biased differences in men and women, and actually our gender EQ strengths align with how we’re socialized in society. That starts at birth. So how men and women are socialized, those strengths align. For example, men are socialized to be confident and assertive and competitive and speak up, speak their mind. Women are actually socialized, or reinforced – you can think of that as another word – to be empathetic and to leverage relationships. I find it really interesting that how we’re aligned as individuals also plays into how it shows up in our EQ strengths. Halelly: And of course, you know, some people say that there are gender differences of course that are biological, because by nature we’re created to have different roles in the perpetuation of the species, and so you’d think that a mother needs to be nurturing, and a father needs to be protective and competitive. I know that those are in part also hardwired, and then society probably reinforces. So it’s an interesting dynamic of which came first, which I know we won’t solve today! Shawn: I don’t know if that argument will ever be solved. But there are differences in hardwiring, and I actually in reference to it, I have a whole section of it in my book about gender and the brain. So I break down all the different neurobiology differences. We’re definitely hardwired differently, no question. But, the socialization is equally as powerful, if not more powerful, actually, in how we show up at work as individuals. And, what I mean by that is, because of how we’re socialized, we have differences. So men and women approach virtually every aspect of business differently. For example, we have different preferences in organizational structures that we work within. We network different, we conduct meetings differently, we interpret information differently. We communicate, work in teams, solve problems and take risks differently. And we talked about leadership already, so we actually, virtually every aspect of business is different. I find this piece really interesting, because most people are unaware of these subtle, gender differences that show up in the workplace everyday. Halelly: Okay, let’s break it down, since we have to wrap up. We’re going to talk about one specific action that everybody can take, but before we do that, what do you think is the main thing that people can use this information right now to make a positive change in terms of their own career? What’s really important to do? Shawn: The first step is awareness. I know it sounds cliché, but I find that when I give talks on these topics that especially the gender piece, which we touched on a bit, but most people are completely unaware of the gender differences piece. And so let me just give an example, because I think it’ll help put it in context for your listeners. For example, we problem solve differently. When men solve problems, men are convergent. Men are very good at focusing in on a problem, solving it quickly, solving it efficiently, and they get to it and they’re not distracted. They focus like a laser on a problem to solve it. Okay, that’s very different. That’s convergent. When women problem solve, women are divergent. So when women analyze a problem, they actually scan the environment like a radar, and so they’re divergent in their thinking. They’re looking around, picking up clues from different people from what they see, and they’re scanning the environment, and then they address the problem. As you can imagine, we have very different approaches. Actually this sets itself up for sometimes miscommunications and conflict in the workplace, because we have very different ways in how we problem solve. We have differences in many other ways, but this is just one example. So, how do these differences play out? Fro example, if you’re a female working with males, and you know that they are convergent and they’re problem-solving, one thing you could do to help them is actually to encourage them to pause and maybe look at some alternatives, some other solutions. Because men are like lasers. The focus and are very efficient, but they downside of that is they miss other things. Perhaps other alternatives that may be a better approach. The flipside of it – there’s always a flipside, right – if women are divergent and men know this about women, one thing men can do is not rush women to just get to the answer quickly. Help them brainstorm. Help them scan that environment and look at clues. It may take women longer to problem solve because they’re picking things up, but what data shows is that the result is often correct more often, versus being expeditious and just getting to it. In the end, if you look at a scale, men get to the answer quicker, but it may not be correct. Whereas women take longer, but you have less iterations of doing it again because they took the time to do the due diligence and think through things. Just by having that awareness of how we approach things differently, from a gender perspective, will help you to flex your style and work better within other cultures, other gender cultures. To advance your career, be aware of opposite gender cultures and styles, and then be flexible to work within that. Halelly: I find it very challenging, and maybe we’ll talk about this another time, but I personally find it very challenging to know, how do you become aware of the differences and the styles that maybe are prevalent without creating that loop of creating a bias of expectations? Like, “You’re a woman, you probably solve problems this way,” and I should treat you this way, and you don’t actually even know how this person solves problems and you might be creating a barrier just right there by using that awareness in a way that ends up not being so helpful. I find that to be so tricky, in general, about almost any generalization, not just for gender, but of course for culture or age, for everything. Shawn: But we have to be able to talk through it, though, and talk about it. It’s just like … I have unconscious bias training, so I actually do that. I provide bias training, and one of the criticisms out there that I’ve heard about biased programs in general is they don’t address the issue and they could alienate people. But when it comes down to how we work together in the workplace, the best way is to address the issues up front and ask, “How can we work together to mutually support each other?” Or you could say, for example if there’s a colleague you maybe have butted heads with in the past, say, “I know we haven’t seen eye-to-eye before, but how can we work together to support each other?” Just by saying that, and by being willing to talk about it goes a long way. I think when it comes to gender issues, when it comes to bias issues or any differences we’re having at work, having that and being comfortable with having that candid conversation goes a long way. Halelly: Yes. And this, by the way, is my personal philosophy – I think that whenever you try to individualize your motivation, like you were talking about earlier, the motivation, the instructions, the approach to the people that are actually involved, the more you learn about each individual and their preferences, what they’re seeking to achieve, how they best go about things, what they would like to do in terms of how they communicate and so forth, the better your success results. So you’re not generalizing, but you’re being specific to the extent that you can. You should always seek to do that as a leader in my opinion. Shawn: Absolutely. Just to tag onto that, we’re becoming more diverse every day, as a global society. That’s not going away. Diversity is here to stay, and it’s not going away. So just remember that in context of what you just said. Each employee you have or each teammate you work with is an individual with their own motivations, with their own needs, with their own preferences, and so don’t make assumptions and definitely individualize how you lead. Actually, that is transformational leadership, having individualized influence is actually transformational leadership. Halelly: Cool. Awesome. Well, Shawn, in a very brief nutshell, what’s new and exciting on your horizon these days? Shawn: Actually, the newest and most exciting thing for me is the book. The book actually just launched two weeks ago, Halelly, so this is so timely that we’re talking today on your podcast. Yeah, as you mentioned, it was quite an undertaking, but it took me about a year to write the book and another additional two years of research before that to lead up to it. I’m very excited about it, and it just launched and so it’s out there and it’s actually in bookstores and online everywhere. This is my first book and it’s exciting for me. I’m still in kind of launch mode right now, doing activities around it to get the word out, basically, and get more visibility about the book. Halelly: That’s a major part of being an author is book promotions. Sometimes people are surprised by that. “Oh, wasn’t it just writing a book?” No, getting it out there. So congratulations again. What’s one specific action that you can recommend that our listeners take today or this week that can help ratchet up their own effectiveness, based on your particular lens? Shawn: Be willing to step out of your comfort zone. Because if we stay tried and true to what’s comfortable, and as I mentioned diversity is here to stay and we’re becoming more diverse everyday. Not only gender, but race, disability, LGBT, background, religion, we have more and more diversity in our workplaces all the time now. So, you have to get out of your comfort zone and be willing to not only learn from others, but be more inclusive in your behaviors. Because like I said, we have a whole variety of people out there now, and we just have to keep an open mind and be more inclusive in how we go about things and as far as who we invite people. My advice is get out of your comfort zone, have lunch with someone new. Don’t go to lunch with the same person all the time, because someone right down the hall from you might have the solution for your problem and you may not have crossed paths yet. So, don’t be afraid to get out of the comfort zone and keep an open mind and be inclusive in your behaviors. Halelly: Awesome. Love it. How can people learn more about you and from you and stay in touch? Shawn: The best way is probably at my website, and it’s DrShawnAndrews.com. Given that I have a training background, Halelly you’ll appreciate this, I’ve created a lot of free resources for folks if they’re interested in these topics. They can find out more on my website. There’s videos, blogs, articles, podcasts to radio interviews and other things, but the one thing I just created, it’s a free download for your listeners, but it’s a 25-page power of perception workbook, and it’s a self-assessment based on every chapter of the book. So, if your listeners want to deep dive on any particular topic in the book, and I touch on a lot of different topics, but if they want to deep dive in anything particular, they can do that. They can go deep in one area. I think there’s over 100, 108 different questions in there. It’s a self-assessment, free download on the website. Halelly: Cool. We’ll link to that in the show notes and hopefully people will connect with you there. Thank you for taking the time today and speaking with us. We appreciate your time, thank you. Shawn: Thanks Halelly, it was a pleasure. Halelly: So, what did you think TalentGrowers? This is a live wire type of topic. I thought it would be an interesting one to think about and bat around. I’d love to hear about what you thought about the topic, about the episode, and of course what you want to hear about and learn about in the future from me, from guests, topics, people – I am so open to your input, because this show is for you. If you’re interested in learning more about how to step out of your comfort zone, which was our topic of discussion at the end there, definitely check out – if you haven’t already – check out episode 81, with Dr. Andy Molinsky, because it was all about stepping out of your comfort zone. All right, I am so looking forward to hearing from you. You can always leave me a voice message on the website, TalentGrow.com, on the black tab on the right. You can just click on that and leave me a voice message. You can email me, halelly@talentgrow.com. You can tweet at me, you can leave a comment below this episode on the show notes page, which is by the way where we link to everything we mentioned in this episode, and I want to hear from you. Thank you for listening. I’m Halelly Azulay, your leadership development strategist here at TalentGrow, and until the next time, make today great.